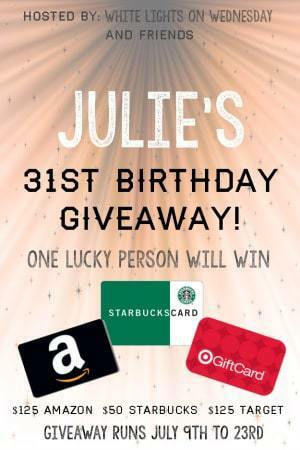 Julie from White Lights on Wednesday is celebrating a birthday this month, which means it’s time to get the bloggy friends together and give YOU the chance to win the presents in the $300 Gift Card Giveaway. We’re going to be giving away three gift cards to one winner. They include $125 to Target, $125 to Amazon, and $50 to Starbucks. Open to US residents only. Giveaway will run July 9th 12am to July 23rd at 11:59pm (all times are Eastern). Scroll on down to enter! My favorite birthday cake is the recipe that my mom used to make for all my birthdays. I like ice cream cake. Homemade chocolate ice cream cake! I love red velvet cake! With cream cheese frosting yum! yellow cake with chocolate whipped cream frosting! I love chocolate cake with chocolate frosting! Moist vanilla cake with a fresh strawberry filling, and a lightly sweetened vanilla or cream cheese frosting. Publix has a cannoli cake….OMG!!! I love German Chocolate Cake! Growing up I would choose between Pineapple Cheesecake or Pistachio Cake – now: White Cake with Strawberry filling with a Whipped Cream Frosting and Fresh Strawberries – YUMMYNESS! My favorite is vanilla with vanilla buttercream frosting. Yumm!! For birthdays we love Carvel cake because it’s become our “special” treat item. But otherwise we love cheesecake! I love love love Funfetti cake 🙂 What an awesome giveaway!! A perfect white cake with perfect white frosting! I love my mom’s pistachio cake! in my house it is Pineapple upside down cake in the Cast Iron Skillet. My favorite birthday cake is yellow cake with chocolate frosting! I love ice cream cakes! That Italian sponge cake thing, infused with amaretto, topped with glazed fruits, and the sides covered with slivered almonds, with fluffy icing and more bits of fruit between the layers . . .
Ice cream cake is the best! Chocolate cake with buttercream icing! I love red velvet cake with cream cheese frosting! What a great giveaway! Growing up in Texas my mom always made a banana split cake. I know this is probably atypical, but I love that. I now live in Michigan, and I miss her and her cooking. From time to time I make that cake. It’s very nostalgic. My favorite birthday cake is one that involves chocolate. Chocolate cake with butter cream frosting and raspberry filling! ice cream cake from Carvel! The best birthday cake is butter yellow cake with chocolate buttercream frosting. And sprinkles, obviously! Chocolate cake with peanut butter icing or cheesecake! My fav is hummingbird cake…can’t beat it! Thanks for a great blog! I love chocolate cake with raspberry filling and chocolate frosting. Angel Food cake with Cool Whip and big strawberries all over. My grandma’s chocolate chip cake! Anything with cream cheese icing! I’m a chocolate girl…give me a chocolate cake with fudge frosting! Amazing giveaway! Thanks so much, and HAPPY BIRTHDAY!! 🙂 My favorite cake is probably red velvet, or chocolate…yum! Whatever my husband feels like making! My favorite birthday cake is yellow cake with lots of chocolate frosting! The chocolate mousse cake my stepmom makes for my birthday every year. My favorite is definitely a chocolate truffle cake. I once had a frozen yogurt cake and it was soooooo delicious! My favorite birthday cake is chocolate chip. Happy Birthday! Cheesecake is my favorite cake. I love all birthday cake and party planning. My favorite birthday cake…must involve chocolate. Icecream is a plus! I like chocolate cake with cream cheese icing. Yum! Blue Ribbon Carrot Cake is the best! Chocolate icing with yellow cake. I love Funfetti cake! So good! I used to always eat vanilla, but I think I would like chocolate now! I love white cake with white frosting. My mom’s white texas sheet cake! My favorite is my grandmother’s chocolate cake with classic royal icing on it. Best cake I’ve ever had! My favorite cake is an ice cream cake. Ice cream cakes are my favorite!! Double Chocolate cake with Ganache frosting ! Pick me! This is great! Vanilla cake with strawberry filling and vanilla buttercream. Does ice cream cake count as a type? It’s my favorite! My favorite birthday cake is traditional yellow, with chocolate frosting and lots of sprinkles 🙂 I hope I get one for my 31st birthday on July 23! I love ice cream cake! My favorite birthday cake is vanilla with vanilla frosting. Thanks for the giveaway. Good luck everyone. I actually love a strawberry shortcake as my favorite birthday cake! I love Spice Cake wit Cream Cheese Frosting! White cake with whipped cream/cream cheese frosting and lots of fresh berries! Fudgie Chocolate with gobs of peanut butter frosting…. !! I love all these recipes. Look forward to seeing whats in my inbox. I love almond cake with a whip cream-like frosting and a raspberry layer!! My fave bday cake is vegan red velvet. My favorite birthday is a white cake layered with blackberry sauce and buttercream icing! I love all your healthy snacks as well as all of the recipes u post. Double chcolate fudge cake! Mmmmmmm!!!!!!!! Love angel food cake with a light drizzle of frosting! Favorite birthday cake – I actually don’t have one because I don’t like cake. This is awesome! pick me pick me! Chocolate cake with a raspberry cream layer and butter cream frosting – best ever. Happy birthday Julie! Happy birthday Julie!!! Hope it’s a wonderful one. Thank you to all the beautiful ladies who are sponsoring this giveaway. ♥you all!!! Favorite cake, birthday or not, is chocolate with chocolate frosting. Why mess with perfect?!? I love anything with pb & chocolate. I like a chocolate cake with chocolate icing. I love chocolate cake with raspberry filling, topped with chocolate ganache of course! My favorite birthday cake is anything that is made out of ice cream! German Chocolate Cake! Homemade by my Aunt is the best! I love these online blog contests! Plus they’re still easier to win than the lottery I don’t even play! I love ice cream cakes.